Athletes Roll was started in May 2016 to spread awareness for adaptive sports both in and out of the disabled communities. Read below to hear how we got started and what we’ve been up to! Welcome to the story of Athletes Roll. The stars of the story are Anthony and Lisa Jennings, residents of Londonderry, New Hampshire. Anthony has Becker Muscular Dystrophy, a neuromuscular disease that progressively weakens his muscles. Anthony transitioned into a power wheelchair when he started college at the University of New Hampshire to maintain his independence. At this point, he was introduced to a sport specifically for power wheelchair users called power soccer. Excitedly, he started playing for the Northeast Passage Wildcats in New Hampshire. After a year of new adventures in the sport, Lisa attended a Wildcats power soccer game wearing a shirt from Under Armour that read “Athletes Run.” Since she is not an avid runner, she wore the shirt not to showoff her workout skills but to match her new pink sneakers! Once she started watching her son’s team play that day she realized her mistake: these athletes around her can’t run but they’re just as much athletes as ones that can. She felt terrible at her mistake and thought the players and families would think she was being insensitive. Not many people noticed the shirt (and those that did told her they found it funny) but she had a brilliant idea amidst the fright. She would have her husband take a picture of her wearing the shirt with the team in the background so that she could suggest a new idea to Under Armour: “Athletes Roll” shirts to support adaptive athletes! Two months after sending in the proposal we heard back from the manager of the Under Armour Innovation Lab who said they were touched by the story and would see what they could do. And what they did was truly amazing! While they couldn’t take on a new clothing line at the time, they took the time to make a customized Athletes Roll logo (which we still use today!) and made 50 Athletes Roll shirts for all of the athletes, coaches, and family members on Anthony’s team. Northeast Passage Wildcats and Powercats after receiving Athletes Roll shirts from the Under Armour Innovation Lab in 2012. In the fall of 2015 it was announced that the Northeast Passage Wildcats were going to the Founders Invitational in Wooster, Ohio. Anthony came up with the idea to sell new Athletes Roll shirts to fundraise for the team’s trip. Thinking that could definitely help dampen the costs of the trip we had each player sell preorders for shirts to friends and family. Expecting to sell maybe 50 shirts in total we were amazed to see how excited people were. We ended up selling a couple hundred shirts which significantly helped out with the costs of the trip for individuals as well as a donation to the Northeast Passage organization to assist with other costs. The fundraiser showed adaptive sports to so many people and we knew at that point that we wanted to continue spreading this message. 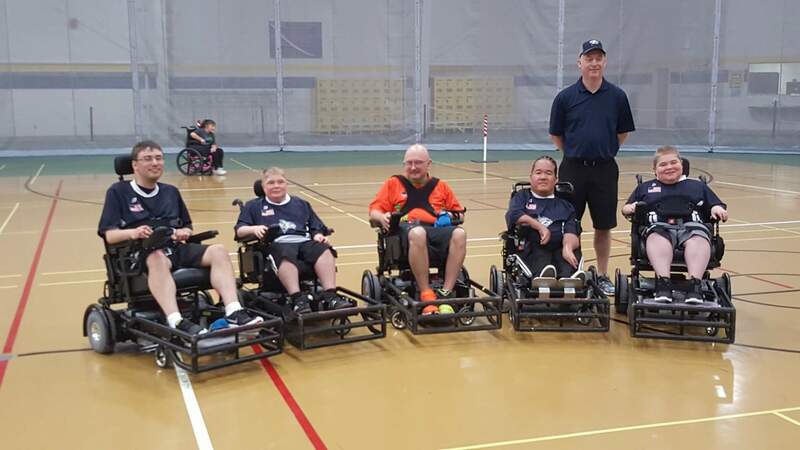 Moving past the summer of power soccer we attended several other adaptive sports events. We participated in the annual MDA Muscle Walk in New Hampshire which raises awareness for Muscular Dystrophy. We took in the amazing Paralympic Games held in Rio de Janeiro, Brazil. And we joined many other local adaptive sports organizations at an Intro to Paralympic Sports held by Adaptive Sports New England! Since then, we’ve continued to spread out message of the importance of adaptive sports to people with and without disabilities. We’ve expanded to new sports, recently covering sled hockey extensively, spoke at roundtable events to introduce these opportunities to families with kids newly diagnosed with neuromuscular disorders, and have continued selling our shirts to raise money for the incredible adaptive sports organizations in our area. We hope to continue growing and spreading the word about these amazing sports and hope you’ll join us on our journey! Follow along on our Facebook, Twitter, and Instagram pages, check out our resources and adaptive sports pages, and keep checking back here for updated articles! If you’d like to be the first to hear about new posts from us, hit the subscribe button below! Thanks! Lisa this is truly wonderful. What a terrific testimony to you and your son! You should contact Walter Reed, I bet they would be thrilled with your success. I work in cardiology at Boston Children’s and very familiar BMD. Would love to help. Hope you are well. You look just like the good ole MHS days. Thanks so much Julie. I’d love to connect and will reach out via email.